​Since the Santa Cruz Area Chamber of Commerce's beginnings in 1889, our commitment to the businesses and people of Santa Cruz has not changed. Our dedication to bringing together businesses, workers, residents, organizations, citizens, and local governments to promote economic vitality and prosperity in Santa Cruz County has grown to meet the needs and challenges of our community through the years. ​Santa Cruz was one of the original 27 counties created when California became a state on Feb. 18, 1850. The population was 643 and growing, as more people moved to the area to take advantage of the great climate and natural resources. Industries included lumber mills, lime kilns, flour mills, factories, tanneries, commercial fishing, dairies, agriculture, and wineries. Meanwhile, businesses, services, and stores were growing and in the 1870s, a concert hall and an Opera House were built in downtown Santa Cruz. Businesses sprang up in other areas of the county along Soquel Avenue, in Seabright, in Capitola, Pajaro Valley, and in the mountains. "To foster, encourage and develop the mercantile, manufacturing, agricultural, horticultural, viticultural and home interests of the City of Santa Cruz and of Santa Cruz County; to collect, preserve, and circulate useful information concerning said city and said county; to encourage wise and helpful legislation, and oppose the enactment of all laws which might injuriously affect the best interests of said city and county; to promote integrity, fair dealing and good faith among members; to forward the improvements of streets, roads, avenues and public parks; to widen and extend our railroad and transportation facilities; to aid and encourage the erection of needed public buildings, the establishment of new manufactories and the advancement of local improvements; to buy, sell, lease and improve real estate in the interest of the corporation, and generally to strive with united efforts to increase the wealth, industries, influence, trade and population of said city and county." The Board of Trade met in the County Bank Building in downtown Santa Cruz. The first president was Dr. Henry H Clark, mayor, doctor, and member of the Santa Cruz promotion committee. He started the first electric light business with Fred Swanton and the first electric railway in 1891. The early 1900s saw the end of the lumber and lime industries in Santa Cruz County, but the rise of tourism and agriculture. Businesses sprang up to cater to the tourists: hotels, cottages, restaurants, and attractions, casinos, and more. And, farmers were drawn to the great soil and year-round growing climate in Santa Cruz County and began establishing farms and vineyards throughout the area. As the county moved away from industry and toward tourism and agriculture, the Chamber was instrumental in creating the first redwood park, worked to attract new residents the county, and promoted Santa Cruz as a tourist destination. The earthquake of 1906 prompted the Board of Trade to continue to lobby for a paved road across the Santa Cruz Mountains. In 1900, the Chamber worked with a group of conservationists called the Sempervirens Club in the effort to save the redwood forests of Big Basin. The building of the Big Tree Road was done under the supervision of the Board of Trade. In 1902, the first California redwood park was created, now known as Big Basin State Park. In the early 1900s, the Chamber had second-story offices on Pacific Avenue at Lincoln Street. 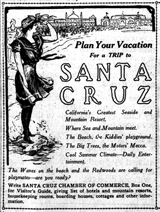 In 1904, Fred Swanton and leading members of the Board of Trade toured California and Nevada promoting Santa Cruz as a vacation destination. In 1908, the Chamber lobbied for Santa Cruz to be part of the celebrations to welcome the entire U.S. Atlantic Fleet to Santa Cruz Harbor. There were three days of celebrations, parades, parties, and balls, plus a Chamber-sponsored trip for 500 sailors to see the Big Trees. In 1908 the Board of Trade of Santa Cruz was renamed the Santa Cruz Chamber of Commerce, combining the Board of Trade and Santa Cruz Promotion and Entertainment Committee. In 1907 the Chamber urged the Southern Pacific Company to complete its rail line over the mountains to Santa Cruz County. The mountain line was completed in time for the summer business of 1909. The Chamber welcomed folks on the first train over the hill on June 2nd. The teens was a time for growth in Santa Cruz, with new tourist attractions being developed, movies being made throughout the area, and the county's dreams of a paved highway over the summit finally being realized. In 1910 the Chamber established a committee to construct a municipal wharf for shipping. The Chamber issued $165K in bonds to be guaranteed by the city to build the new wharf in 1913, which just celebrated its centennial. In 1910, the Chamber issued a telegram inviting Andrew Carnegie to visit the library and Big Trees on March 11. The Chamber arranged all the festivities for the visit. The Chamber of Commerce raised the funds from the US Senate ($90,000) to build the Santa Cruz Post Office building on Front Street in 1912, where it is still in use today today. To induce day trip visitors to stay in Santa Cruz and visit the attractions, the Chamber of Commerce set up a visitors' information booth at the Casino in 1915, staffed by the Chamber Ladies' Auxiliary. The women dispensed free flowers daily to visitors who remarked, "We have seen lots of beautiful flowers since we came to your State, but they all had a sign 'hands off' tacked near them, except in Santa Cruz; here you give us all we can carry away; how lovely." In 1916, the Chamber of Commerce promoted the establishment of movie studiosthroughout Santa Cruz County. Nearly 50 movies were filmed locally, in DeLaveaga Park, in Boulder Creek, at the Boardwalk, at Natural Bridges, in the redwood forests, and throughout the county between 1911 and 1930. In 1918 the Santa Cruz Chamber and Farm Bureau started the first annual Egg Laying Contest in California to promote the growing poultry industry in Santa Cruz County. The earthquake of 1906 made Santa Cruzans realize how isolated they were in Santa Cruz County when railways to Santa Cruz were damaged. The Board of Trade urged creation of a road across the Santa Cruz Mountains. In a letter to the Santa Cruz Sentinel, the Board wrote, "If such a road should materialize...our location on the coast line might yet be a cause of our becoming a city of considerable importance." It wouldn't be for another 13 years that the first paved road over the summit would be built. In 1919, after the Santa Cruz Chamber had lobbied for years for a highway over the summit, the Glenwood Highway was built. The roaring 20s were a booming time in Santa Cruz. The county was developing the Boardwalk as we know it today, launching the Miss California pageant, promoting Santa Cruz as an industrial region, and promoting tourism via the new Suntan Special trains from San Francisco, Oakland, and San Jose. In 1920 the Santa Cruz Area Chamber of Commerce incorporated as a local, non-profit member organization dedicated to promoting economic vitality and prosperity in Santa Cruz County, to ensure a high quality of life, fairness and efficiency in community decision making, and efficient and sustainable business practices." In 1924, Chamber member Arthur Looff was granted a permit to build the Giant Dipper roller coaster, supporting the Chamber's plans to develop a year-round tourist season. 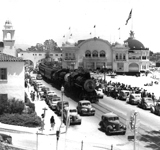 The Chamber continued to promote the Suntan Special trains that brought visitors from San Francisco, San Jose, Los Gatos and Felton to the Boardwalk. In 1924, The Miss California Pageant was co-founded by the Chamber of Commerce and Fred Swanton. The annual event was run by the Santa Cruz Chamber and held in Santa Cruz until 1985. Santa Cruz fared better than many parts of the country during the Great Depression, though no one was immune to the financial collapse. The Chamber, however, worked to keep the economy strong throughout the turbulent decade, promoting a booming convention business, helping launch the new surfing craze, participating in ceremonies celebrating the opening of the Golden Gate Bridge, and lobbying for funds to build the Santa Cruz Civic Auditorium. In the early 1930s, the Chamber of Commerce operated Capitola Airport, the county's first airport. 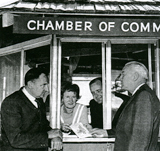 The Chamber worked to create jobs after the Depression in 1936 through a series of initiatives,including issuing scrip, and projects such as the public remodeling of a "shabby house" in the post office plaza. The project was geared to "encourage the remodeling of homes, put men to work, hasten the return of good times." In 1937 the Santa Cruz Chamber's float, complete with marching bands, was part of theOpening Fiesta of the newly completed Golden Gate Bridge. In 1938, the Chamber supported early surfers who formed a surf club and with the help of the Santa Cruz Chamber of Commerce Jaycees, built the Santa Cruz Surf Club Members' Barn on Bay Street, just a few blocks from Cowell's Beach. Convention business was big in Santa Cruz, and in 1939 the Chamber secured federal funds under FDR's Federal Works Program to build the Civic Auditorium. The Chamber offices moved from the County Bank Building to the Civic Auditorium, where it remained for the next 46 years. The arrival of WWII in Santa Cruz brought big changes to the area, with military personnel moving into local bases, local residents dealing with rationing and many facing internment, and tourist facilities being taken over for use by the military. During this era, the Chamber continued to work to build the county infrastructure, promote Santa Cruz as a safe place to live through the war years, and attract tourists to the area once the war ended. In 1940, with the support of the Chamber, Highway 17 was completed, linking Santa Cruz by highway with the rest of northern California. In 1942, the Chamber welcomed the wives and families of defense workers and those in the military to live in Santa Cruz during the war. After the war, the Suntan Special trains returned to operation, bringing tourists from San Francisco, Oakland, and San Jose to Santa Cruz. By the end of the 1940s, convention business was booming, and the Chamber worked to bring 2 to 3 conventions per week to Santa Cruz. The post-war era in Santa Cruz was a time of rapid growth, in population, industry, and tourism. The Chamber worked to attract light industry to the county, supported the creation of Cabrillo College, and helped Santa Cruz recover from the worst flood in the county's history. Santa Cruz County's population rose by 21% during the 1950s and housing boomed along with it. 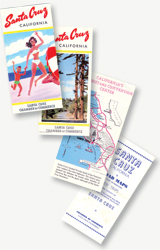 Colorful brochures and maps created by the Chamber continued to promote Santa Cruz County to visitors, and the Chamber continued answering the ever-growing number of written inquiries from those planning a vacation in Santa Cruz. In December 1955, the San Lorenzo River flooded downtown Santa Cruz in 10 feet of water and wrecked nearly 100 homes through the San Lorenzo Valley. After the waters receded, the Santa Cruz Chamber was a leader in rebuilding after the flood, aiding flood victims, creating a committee to approve low-cost loans, advising Red Cross disaster officials, setting up a federally aided urban renewal program, and assisting in the army engineers survey of losses. In 1957, the Chamber promoted the creation of industrial areas in Santa Cruz where light industry businesses could set up operations far from residential zones. The Chamber passed a resolution in 1957 encouraging the city to take over and operate the airport at Sky Park in Scotts Valley and donated money that kept the airport open in north county. The Chamber had long supported the development of a junior college in Santa Cruz County and in 1959 Cabrillo College opened its doors to the first students. ​The sixties in Santa Cruz were a time of social and political changes. Chamber membership was at record highs and a record number of tourist inquiries were processed by the Chamber. 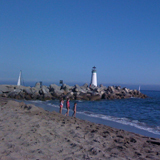 The Chamber worked to bring the University of California to Santa Cruz, supported the development of the Santa Cruz Yacht harbor, and created the Santa Cruz Convention and Visitors Bureau. The Chamber helped prepare a master harbor plan, secured funds from Congress, and in 1963, the Santa Cruz Harbor was completed. Camber leader and Sentinel Editor, Gordon "Scotch" Sinclair, worked to secure the land for the University of California to establish a campus in Santa Cruz. In 1965, the University of California Santa Cruz was opened. In the 1960s, the Santa Cruz Chamber of Commerce founded the Convention and Visitors Bureau, opening a visitor's kiosk in 1966 at the corner of Ocean Street and Dakota Avenue to answer questions of tourists visiting Santa Cruz. The CVB remained part of the Chamber until 1977. As awareness of the need to protect quality of life and the importance of environmental stewardship grew in Santa Cruz, the Chamber helped develop historical preservation ordinances and environmental studies, while continuing to promote clean, sustainable businesses in the county. In 1975, the Chamber participated in developing Santa Cruz's historical preservation ordinance, established to protect the City’s historic and architectural resources. The Chamber continued to support developing businesses, and in 1975 set up a local development corporation to help fund facilities for small industries and free counseling services and classes for small businesses in the seventies. In 1977, the Chamber worked with city officials to develop a master environmental impact report for the city. And, the Chamber continued its involvement in the Miss California Pageant through the seventies and into the eighties, responding to changes in the event, television coverage, and a growing opposition to the competition from women's groups. In 1975, the Chamber elected its first woman president, Judy Sadlier. In the 1980s, Santa Cruz survived a series of natural disasters in Santa Cruz: a Mediterranean fruit fly invasion, devastating winter storms, wildfires, and the most powerful earthquake since 1906. Debate over offshore oil drilling, county development, and growth in the County continued. The Chamber provided support for discussions of the major issues facing Santa Cruz, and took a leadership role to help businesses and residents get back on their feet after disasters struck. The Chamber continued to answer calls and letters from tourists, up to 100 telephone calls a day and 350 letters a month. 1983 The Chamber created the Computer Festival, featuring new technologies and speakers, including Steve Wozniak. In 1984 Chamber created a series of monthly Small Business Council meetings where business people would share their knowledge and advice to small groups. In 1984, the Chamber of Commerce created a report on housing issues in Santa Cruz County, with recommendations on how to ensure that more of our citizens had proper shelter. In 1985, the Chamber moved its offices from the Civic Auditorium back to the County Bank building, where the Chamber got its start in 1889. The Chamber pushed for continued safety improvements on Highway 17, including widening the highway and adding dividers on the freeway. Just as the Chamber was instrumental in building up Santa Cruz county businesses, infrastructure, and industries in 1889, 100 years later in 1989, the Santa Cruz Chamber was a leader in rebuilding Santa Cruz after the earthquake. The Chamber was the principal sponsor of the tents that temporarily housed downtown Santa Cruz businesses after the earthquake. And when the dust cleared, the Chamber was instrumental in planning the downtown rebirth. The Agency for Rebuilding Downtown Santa Cruz formed in 1990 was led by Chamber Executive Director, John Lisher. In the 1990s, the Chamber helped Santa Cruz weather the dot-com bust. High technology had become the third pillar of Santa Cruz's economy, along with tourism and agriculture. Through programs such as the annual Technology Exhibition Symposium, the Santa Cruz Chamber helped businesses and knowledge workers connect to continue innovating here in "Silicon Beach." When a nationwide recession hit Santa Cruz in the early 1990s, Chamber member banks offered loans to help businesses keep their doors open. In 1992, the Chamber continued to help growing businesses with organizations such as the Chamber's Women In Business group, a networking, education, and support group for women who work for local member-businesses, and the "Success Factors" seminar, precursor of the annual Women's Leadership Forum event. The Chamber supported the development of the McPherson Center for Art and History in 1993 and in 1994 helped celebrate the opening of the Henry Mello Center for the Performing Arts in Watsonville. To influence policies that affect business and community life in Santa Cruz County, the Community Affairs Committee developed position statements on education, water, transportation, and housing in Santa Cruz. See the Community Affairs page to read more about the Chamber's positions on these issues. The Chamber continued promoting business in Santa Cruz with retail workshops and studies led by national retail experts. In 2001 the Chamber lobbied for the transportation commission to concentrate on roads, including Highway 1, and "improving the movement of people by how they actually behave and are likely to continue to behave over the next 25 years." In 2003, the Chamber was represented on the Monterey Bay Sanctuary Advisory Council in the 15-year struggle to create a marine preserve. In 2004 the Chamber presented the Building Solutions trade show with 75 local businesses contractors, mortgage professionals, realtors, remodelers, and architects to help bolster the construction trades in Santa Cruz County. In 2008 and 2009, the Chamber brought local Santa Cruzans to China to kick off theChamber’s Travel program. In 2009 the Chamber presented a series of workshops and forums for managing business in the downturn, created a small business survival series, and panel discussions on navigating through difficult times. ​The Chamber continues its leadership role in the economic and cultural prosperity of Santa Cruz County after more than 120 years in the community. In 2010, the Chamber presented a series of seminars, workshops, and panels on using social media and other new technologies to build and grow business. In 2011 the Chamber worked with the City of Santa Cruz to establish the Santa Cruz Beach-Downtown trolley, carrying passengers in the summer in an environmentally friendly natural-gas-powered bus. In 2012 and 2013 the Chamber brought business, education, and government leadersto San Luis Obispo and Boulder to look at innovative ideas, programs and initiatives which might be adapted to our community. In 2013 the Chamber celebrated its 24th annual Santa Cruz County Business Fair, the largest local showcase for B2B and B2C businesses and nonprofit organizations in Santa Cruz County. The Chamber continues to celebrate openings of new businesses with ribbon cuttings; brings the community together to network at mixers; serves as the voice of its members atcommunity meetings; shares knowledge from experts through workshops, seminars, and panels; and continues to promote its member organizations through marketing their new, services, and events. Our local independent Chamber is dedicated to continuing its role as the local voice on behalf of business and the entire Santa Cruz community. We continue our work of bringing together businesses, workers, residents, organizations, citizens, and local governments to promote economic vitality and prosperity in Santa Cruz County. With events to help connect you with others in the local community, programs to help you market and advertise your company to your potential customers, workshops and seminars to fuel your professional development, and the collective voice in local issues afforded by the Chamber, there's never been a better time to join the Santa Cruz Chamber of Commerce. We welcome you to be part of the next century of the Santa Cruz Area Chamber of Commerce. To join the chamber, please complete an Online Membership Applicationor download and fax or mail the Santa Cruz Area Chamber Membership Application. For questions about membership in the Chamber, please contact membership@santacruzchamber.org or call the Chamber at 831-457-3713.